I need some elves. The decorations aren't done. I haven't finished shopping. And I apparently lost my mind sometime ago, because I decided to make a lot of my gifts this year. Now it's December 10th, and I haven't even started them. I don't know what I was thinking. Oh yeah, I wasn't. I have no brain. One thing I have managed to get done is our mantel decoration. 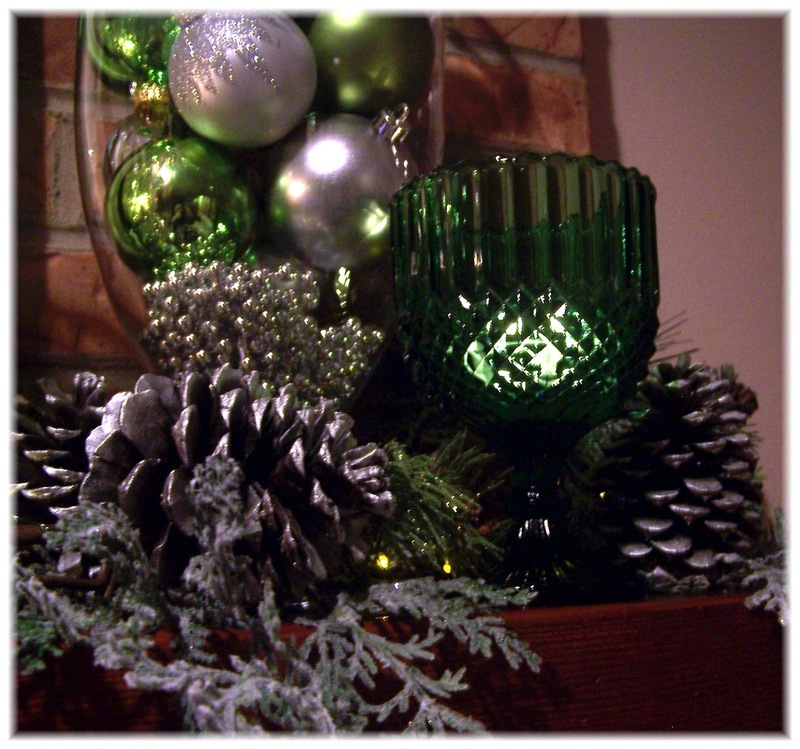 As you may recall, I decided to change our holiday decor color scheme to silver, green and white this year. Last year I didn't do that much to the mantel. But this year I decided to go all out. 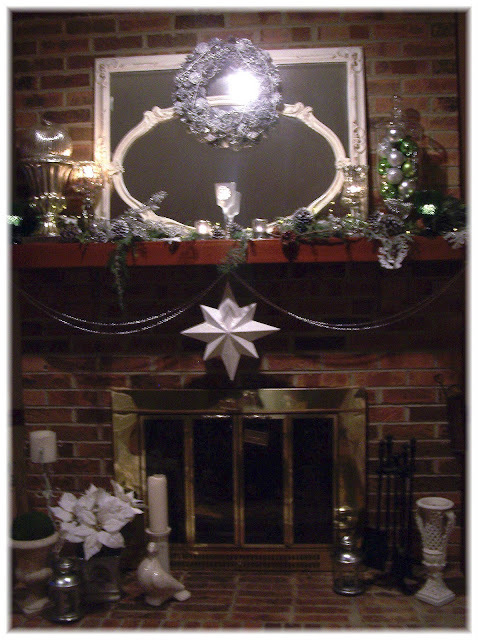 I hung a silver pine cone wreath over the mirrors that are always over our fireplace. 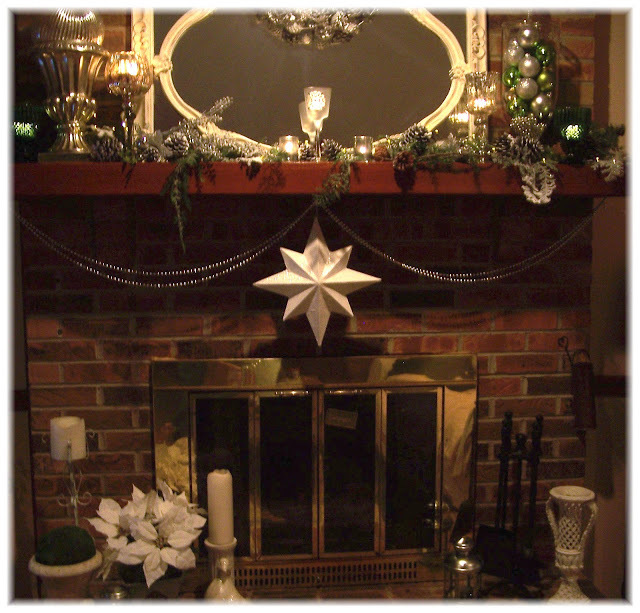 Then I put a large silver urn I had on one side of the mantel, and put a big silver ornament in it that I used to hang in the living room . Next to that I put a large mercury glass candle holder from Home Goods, and one of the green hobnail goblets I showed you from one of my thrift store forages. 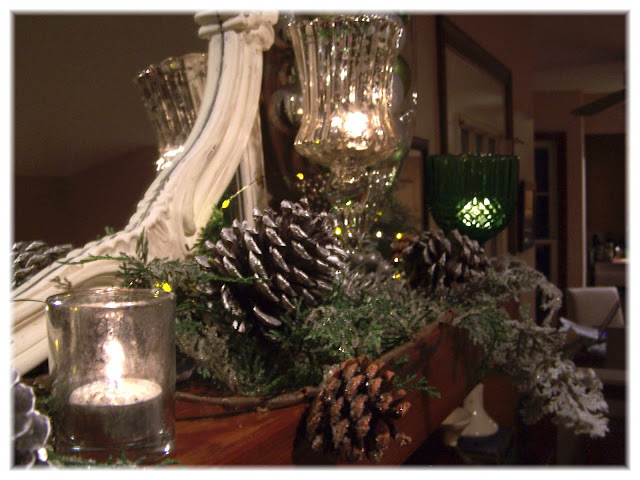 I sprayed some pine cones silver and tucked them into the garland placed along the mantel. 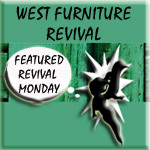 I added a couple of my faux mercury pieces and some fancier pieces I picked up from Michaels. On the other side I placed the large urn with a big glass jar I got from HomeGoods, (I got this on a "Blogger Blind Date" with Connie from Hartwood Roses. We realized we lived just an hour apart and decided to meet for brunch. Of course, a shopping trip was also on the agenda!). 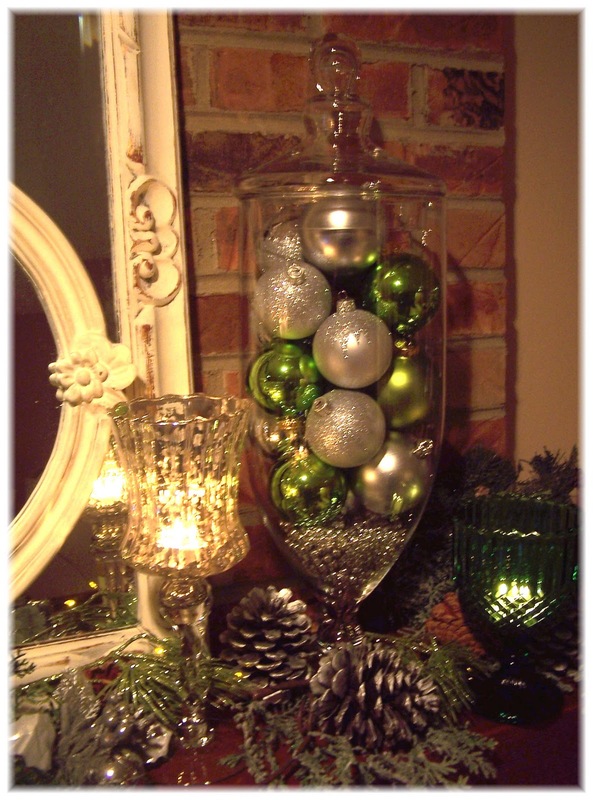 I filled the jar with green and silver ornaments. 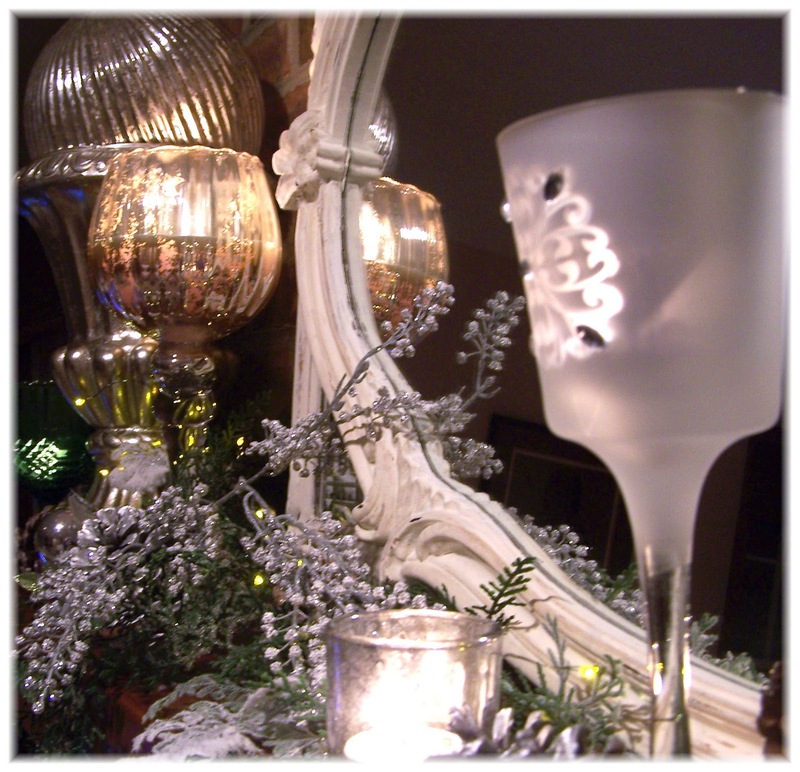 I added more mercury glass and the other green hobnail goblet-turned-candle holder to balance out this end. Under the mantel I hung a silver bead garland and a white star. 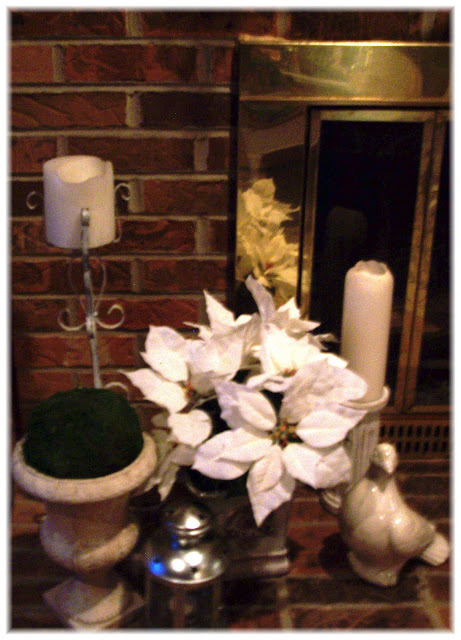 Down below I added a couple of silver lanterns from Ikea that I've used outdoors, and a silk poinsettia to some candles that are usually there, and an urn that is usually in the foyer. The poinsettia is silk because we have dogs and cats. I read on someone else's blog (can't remember whose), that the idea that they were harmful to animals is a myth. However, according to the ASPCA and my vet they are toxic to cats, and will make dogs sick. So as much as I love the real ones, I don't keep them in our house. I love the green and silver. Wow! Your mantel looks great!! In my experience, dogs aren't usually all that helpful when it comes to decorating. Cats, on the other hand, have definite opinions on the subject and will gladly rearrange whatever you have done ... especially the Christmas tree. i, too, have no mind left. i am baking, decorating, cleaning, painting and i don't know what else, since my brain is suffering a major meltdown. 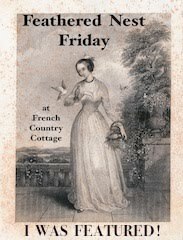 Your mantle looks lovely, Deborah. I love the mercury glass, and the green, silver and white color scheme. Just popped over from Debbie Doos! Deborah, your mantel looks so pretty and sparkly. Love the color scheme. 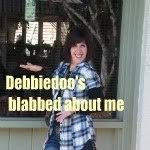 Now following via Debbiedoo's newbie party. I hope you will follow me, too! Happy Holidays! Very pretty, you did yourself proud. 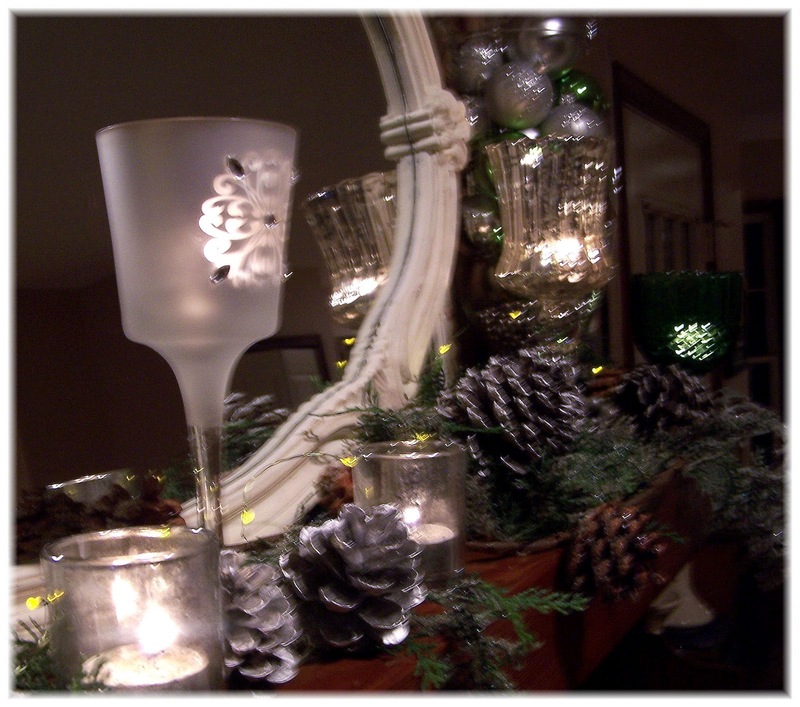 Very pretty very sparkly...love the use of the mirrors in decorating and the green and white is so fresh. 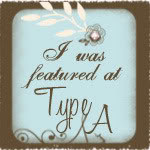 Found you through this week's party at Coastal Charm! Very pretty Deborah. The silver bead garland is a great touch. Very pretty. I love that huge star in the middle and the fact that you used your outdoor lanterns on the hearth. Great job! I am still waiting for the elves to show up at my house... Beautiful mantel. I love all the bling, especially the lovely wreath. Looks nice. You could always just spray the tree with silly string and call it a day! ;o) Disclaimer: Not sure if it's fire retardant though. 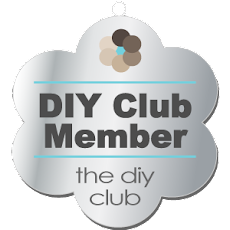 You know I love this and it looks like the rest of bloggyworld does too by looking at your comments!!! 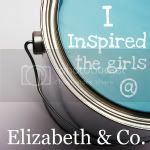 I'm happy to be following you for further inspiration!!! Very pretty. I too started out making all my gifts and wound up with most made, but sent my husband off to buy gifts for all the guys. Better option. Next year all will get gift cards. I am pooped!! 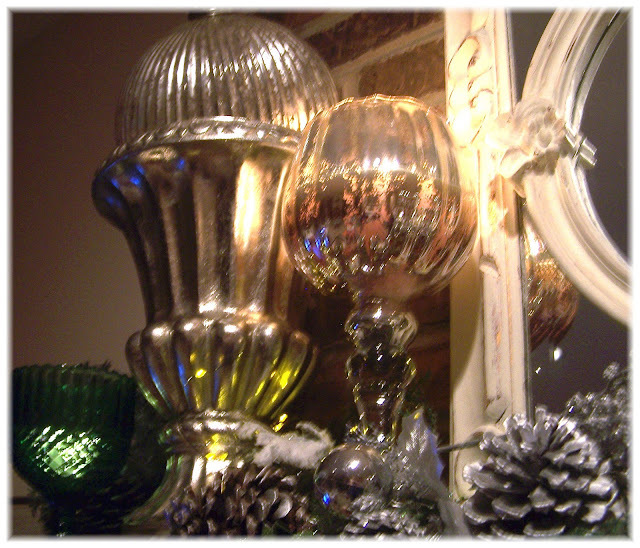 This was a fabulous mantel, I love all the mercury glass! Thanks for sharing.